The other day, a friend of mine (who is an RN) was telling me about her daily dilemma: what should she wear to protect herself from the chilly hospital air conditioning? The main obstacle for her is the fact that she is required to wear her iD badge at all times, but when she attached it to her scrubs it wasn’t visible once she put on her jacket or sweater. She had tried fleeces and hoodies and they kept her pretty warm, but there wasn’t any place to put her badge except the collar (scratching against her neck all day) or the zippered lining (which meant she couldn’t zip it up). Scrubs and lab coats company Medelita is well known for their flattering designs, performance fabrics, and innovative features. 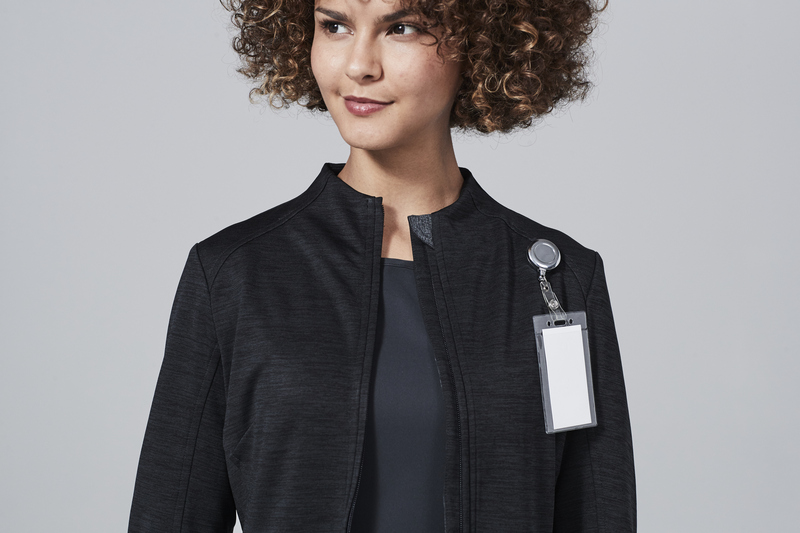 They released their brand new women’s scrub jacket a few months ago, and not only does it have ample pocket space (and a zippered sleeve pocket to boot! ), they also added a small but kind of life-changing feature: the ID badge pocket. The Ionic Scrub Jacket is the first of its kind in many ways, but I particularly l particularly love this badge pocket. It’s hidden on the left shoulder seam so that it’s invisible when you’r not using it, and it allows you to clip your badge onto your jacket. Simple yet genius. Count me impressed. This entry was posted in Medical Scrubs, OR Scrubs, Physician Scrubs and tagged Design Details, hospital scrubs, Performance Features on September 27, 2017 by Ariel Jacoby. Scrubs are pretty comfortable when you think about it, at least compared to the stiff suits and neckties that professionals must wear in so many other industries. Anything with a drawstring or elastic waistband tends to be pretty comfortable, but these scrubs pants for men have been highly rated by almost every single purchaser. The Modern Fit Men’s Scrubs Pants have a dual elastic/drawstring waistband, ensuring that they are neither too tight or too loose, but just right. They also come with a built-in fly zipper, an ideal feature for anyone under a time crunch. The material is much softer than what you’ve probably come to expect from your scrubs. The inside of the material feels about as soft as flannel PJ pants, rather than the scratchy thin fabric that you’ll find in cheaper scrubs. A lot of men seem to have appreciation for the fit, which is where these scrubs pants truly stand out. With the perfect length and cut, the fit actually resemble a pair of chinos or nice pants more than a pair of slouchy sweats. Check out these amazing scrubs pants for men here, and don’t take my word for it – check out the reviews at the bottom of the page. This entry was posted in Medical Scrubs, Men's Scrubs, Physician Scrubs, Trends In Medical Apparel and tagged Customers, Men's Scrubs Pants, Scrubs Pants on October 17, 2016 by Ariel Jacoby. If you’ve been following this blog, you know we have a strong preference for Medelita products. What can we say? They really are the best in terms of fit and quality. They last far longer than any other scrubs or lab coats, and they’re easy to take care of because of the wrinkle release and stain release technology thats imbued in the fabric. One of the many reasons we prefer Medelita scrubs is not about style or fit: it’s because they are quite literally the softest scrubs I have ever had my hands on. They are so comfortable that I have even worn them to bed on occasion, and I would even consider wearing them on a long-distance flight. I recently asked Medelita’s chief of operations why their scrubs are so soft, and he gave me the inside scoop. Apparently, the finish of the scrub fabric on the inside is slightly different than the outside: this is because the fabric is brushed. A finishing process for woven or knit fabrics in which brushes or other abrading elements are used to raise a nap (a fuzzy or downy surface). Brushed fabrics have a soft, slightly weathered, broken-in feel. You know that favorite old t-shirt that you have, that has become so soft over years of wear that it’s become the most soft and comfortable thing you own? It’s basically the same thing, but for scrubs. You can’t wear your favorite old t-shirt to work…but you can wear your Medelita scrubs! This entry was posted in Medical Scrubs, Men's Scrubs, Nursing Scrubs, Physician Scrubs, Student Scrubs, Women's Scrubs and tagged Comfortable Scrubs, Performance Fabric on July 8, 2016 by Ariel Jacoby. 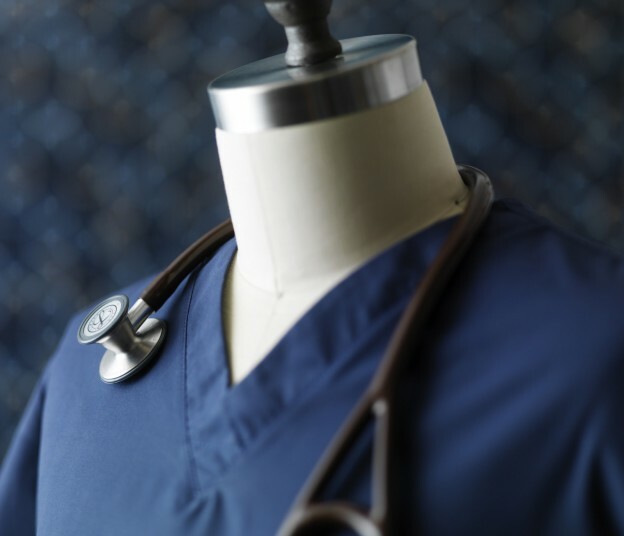 In recent years, Medelita has gone above and beyond to change the standard of medical wear and improve scrubs for physicians, nurses, physician assistants, and every medical professional in between. The comfort and functionality of our scrubs sets us above the rest; we continue to go unmatched in fit, quality, ergonomics, comfort, and performance. 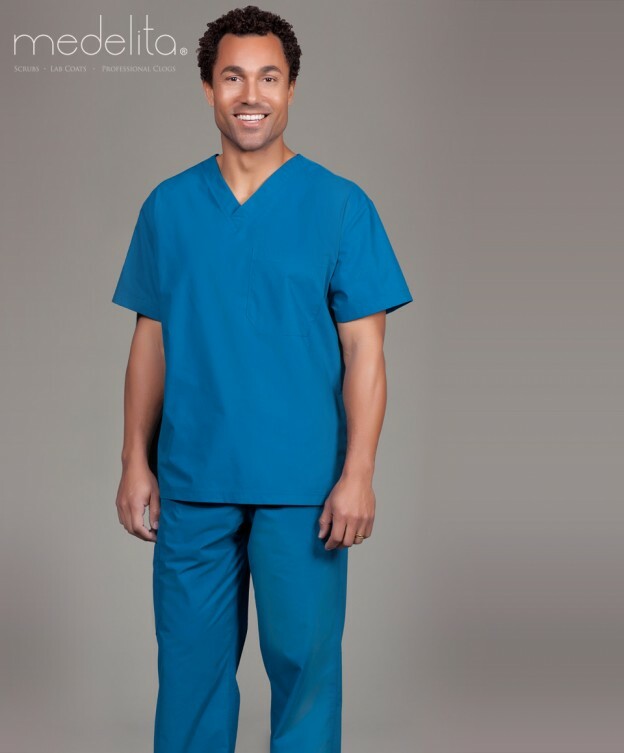 The ergonomic design of our scrubs flatters the professional while allowing them to have a comfortable range of motion. Many small details on the men’s and women’s scrubs, while they may seem minor, benefit the wearer significantly. The beautifully fashioned, top darts at the bust of the women’s top offer a raised V-neck that create an elegant, flattering neckline that lays flat overall. Along with a higher neckline the women’s top has shorter sleeves allowing for freedom in movement. The men’s top has been re-shaped for a improved fit in the torso. Both the men’s and women’s resemble a high quality woven short-sleeve shirt; featuring a raised neckline and a roomier chest pocket. Our well designed fit from the shoulders to chest allows for an enhanced range of motion while visually creating a narrower frame. Medelita scrub pants feature many outstanding fashion forward designs as well. Men’s pants offer the drape of slacks, the casual length of your favorite jeans, while having the comfort of athletic pants. Along with a drawstring and latex-free elastic waistband, the men’s pants have a zippered fly. Both men’s and women’s pants have a relaxed fit around the thighs and groin for less pulling while sitting. The straight leg fit of our pants, with a contoured rise, are flattering and modern. On all products, the stress-reinforced sewing details are designed for all-day comfort. Medelita fabric is proven to last the lifetime of the product. Not only can the product be home laundered, with no ironing required, but the drirelease® material resists piling, fading, wrinkling, and static cling. The technically advanced performance fabric pulls moisture away from your skin and dries incredibly faster than other performance fabrics or cotton. The supremely soft fabric is known for comfort and performance. FreshGuard® provides bacteriostatic, odor-free comfort. With no chemicals or irritants, our performance fabric is promised to be environmentally friendly. All in all, Medelita scrubs are a step above the rest. Other scrubs brands often have less flattering tops and pants. Their pants have a natural-rise waist with a simple drawstring or back elastic, offering less support or comfort. Many brands sell an outdated flared leg with side vents. Although their tops feature the same short sleeves, they hold a looser fit that does not flatter the professional. Our moisture wicking, fast drying, high performance, odor control, superior comfort, and premium quality is top notch and quality trumps quantity every time. Shop Medelita scrubs at this link. This entry was posted in black scrubs, doctor scrubs, hospital scrubs, Medical Scrubs, Nursing Scrubs, Physician Scrubs, Women's Scrubs and tagged Scrubs on July 6, 2016 by Ariel Jacoby. Hospital scrubs is a large category that includes OR scrubs, ER scrubs, nursing scrubs, scrubs for doctors, scrubs for hospitalists, physicians, clinicians and the list goes on. The easiest way to find exactly what you are looking for is to start searching for men’s hospital scrubs or women’s hospital scrubs. Determine the top 3 characteristics of the scrubs you are looking for. It could be a specific color, features, design or functionality requirements. If you want to narrow down your search even further, you can select additional performance, durability, anti-wrinkle, stain release and other properties. Of course it helps to know what’s available, and compare different manufacturers of scrubs and medical uniforms, read independent reviews to verify company claims and find that perfect hospital scrub you are looking for. “This is a great product, good build and great material. Not flimsy like the stock hospital scrubs. The cut is impeccable and quality is amazing! I would highly recommend Medelita products.” – Scott, hospitalist. I just bought a new set of baltic scrubs, sadly it’s the only color permitted in my hospital from the Medelita selection ( i wish there were more options) but on a positive note I must say that my previous set that I purchased from Medelita almost a year ago is still holding up really well. It didn’t fade like most other scrubs, no pilling either. I still wear it almost every week and often get asked where I got it from! Andrew, Doctor. This entry was posted in doctor scrubs, hospital scrubs, Medical Scrubs, Men's Scrubs, OR Scrubs, Physician Scrubs, Women's Scrubs and tagged clinician scrubs, hospital scrubs, physician scrubs, scrub pants, scrub top, scrubs for hospital, shop scrubs on October 30, 2012 by medelita. This entry was posted in doctor scrubs, Medical Scrubs, Men's Scrubs, Physician Scrubs, Women's Scrubs and tagged clinician scrubs, doctor scrubs, physician scrub pants, physician scrub top, physician scrubs, scrub set, shop scrubs on October 23, 2012 by medelita.